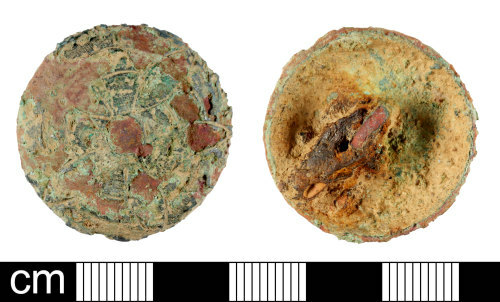 A Post-Medieval copper alloy button, probably dating to c. AD 1600-1700. The button is circular in plan with a convex front and concave back. The front of the button is decorated with an incised floral design, consisting of a flower of 5 eliptical petals, around a central boss and overlaying a series of concentric bands. A central integral rectangular shank projects from the reverse, with a circular drilled perforation. Traces of an iron link remain within the shank. Dimensions: diameter 26.7mm; thickness 10.2mm; weight 8.30g. Read (2005: 39-45) illustrates a large number of extremely similar buttons, all with convex fronts, concave back and integral drilled shanks. They have a range of incised and punched decoration, mostly floral or geometric; although none are identical. Read (ibid:36) suggests they were fashionable in the mid to late 17th century and may have been used in pairs as cloak fasteners as well as buttons.